· The tax dodger signs an employment contract with an offshore company not subject to UK tax. There is a thriving industry that will set up an offshore company for you – we could give you a link, but we won’t. Ask your accountant if you can afford one. · The offshore company invoices the dodger’s clients for his services. For example, when a joker tells jokes on TV the offshore company will invoice the tv company. Being in a well chosen tax haven, the company pays no tax on this receipt of money. · He pays tax on the minimum salary. · For the loan, the Inland Revenue has an assumed interest rate. In July 2012 this is deemed to be interest at 4%. The Inland Revenue assumes that the taxpayer is receiving only the interest as taxable income. 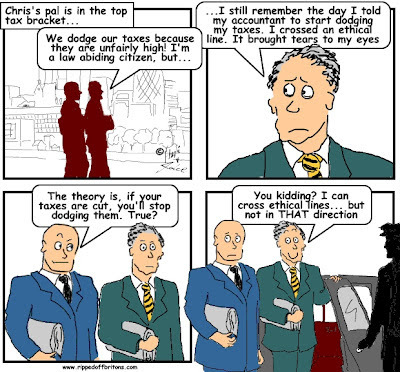 · The dodger pays tax on the interest only: 20% on 4% = 0.8% tax. · take a loan from the company of £859,250. · The taxman deems that you pay interest on this at 4% = £34,370 (which happens to be the 20% band limit). You are taxed on this interest. · Pay tax on this £34,370 (notional interest) at 20%. Which means using a K2 type dodge, on the “loan” of £859,250 you would pay £6,874 tax. An effective tax rate of 0.8% instead of the 50% income tax rate were the “loan” to be recognised as salary. HMRC makes no requirement on how quickly the loan should be paid back - so why bother. Except the loan still exists the next year - another 4% to tax, on income you've already received, and unless you really do only earn the 8k that year, now you're up in the next tax band, too. Unless you leave the UK for that year, actually live in the other country for tax purposes and pay off the "loan" that way. It's a nice theory, but a lot harder than this description suggests. Could work well for those with very variable incomes - pop stars with infrequent major tours, Olympic athletes - not for most though. You are correct, the loan continues to exist and the 4% interest remains taxable in future years. This is just one arrow in the quiver of a well advised tax dodger. Other arrows can deal with the loan in due course. 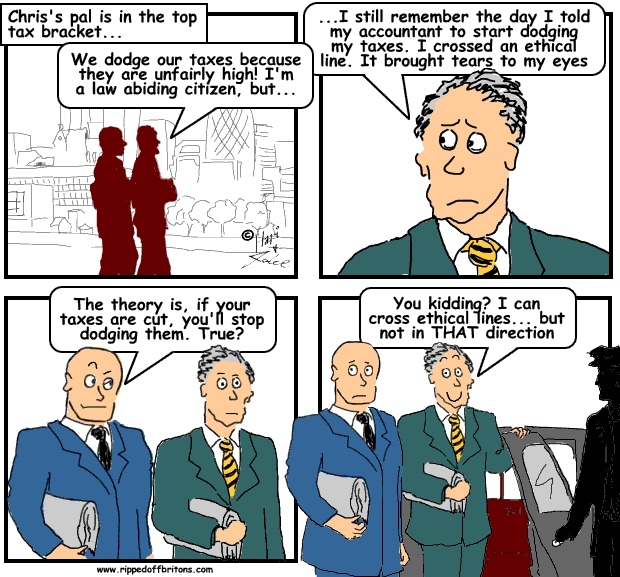 As our list of tax dodges grows - as we find time to write them - we will aim to show this. A Flat Tax of maybe 10% , for everyone , even on benefits , no allowances , no refunds , no accountants , no black economy , simple , easy to understand and Fair . No...the company simply writes off the loan at the end of the year as unrecoverable...that's what I was told by someone who has done this for 15 years consecutively...£500k per year more or less tax free through Isle of Man bank account.